I picked this up in Boots recently after seeing a post on it by Lily. I really liked the sound of this refreshing your skin during the day and the fact that it could be sprayed over make up without it dripping down your face. I travel quite a lot with work which means lots of jumping on and off trains and sitting in air conditioned offices which does nothing for my skin, I carry around Avene Thermale Spring Water Spray in my bag during the summer, which I love for just giving a bit of a boost, but this product is a little more moisturising and states that it works over make up to help refresh the skin. It comes in a small clear bottle (50ml) which is handy to keep in your bag and has lovely things like Lotus Flower, Pro-Vitamin B5 and Vitamin E as some of the ingredients so it's also doing good for the skin, and it just gives skin a little boost which I really like, I normally spray a little bit during lunch and then once again before I go home, unfortunately, it doesn't refresh make up (would love a product that did this!) but it does definitely help to make you look a little more refreshed and dewy which I love. I find one spray works for me, leaving a fine mist of the product on the face that sinks in quickly. During our brief 2 week heat wave a while back, I kept this in the fridge overnight so that it was nice and cool when I spritzed it on by lunchtime, it was heaven in the muggy heat! This is £5.99 and I picked it up here, a little goes a long way with this as well so I think this is a really good price for it. 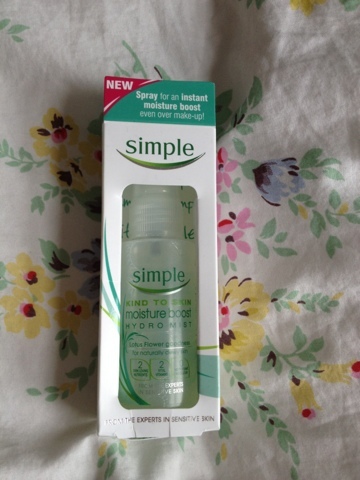 5 comments on "Simple Kind to Skin Moistureboost Hydro Mist"
Ooh very nice, i will have to try this! I've been wanting to try this out! Thank you!